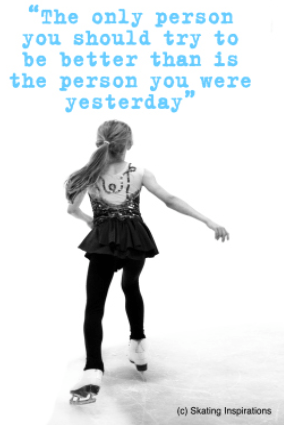 How far you’ve come. Everything you have gotten through. All the times you have pushed on even when you felt you couldn’t. All the mornings you got out of bed no matter how hard it was. All the times you wanted to give up but you got through another day. NEVER FORGET how much strength you have learned and developed. You are ready to take your figure skating test. but the thought of being on the ice all by yourself in front of judges is scary. 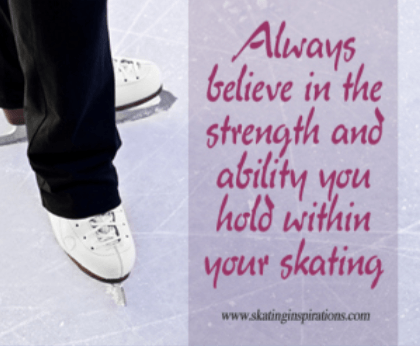 Skating tests can be nerve-wracking, but being well prepared helps. Here are some tips that may calm your nerves and help you shine. Feeling nervous is a sign that you are committed to testing. Many people experience scary skating dreams, an inability to perform skills that used to be easy, sweaty palms or shaky knees. Ignoring the feelings seems to make them worse, so go ahead and notice them. In fact, some people intensify the nerves by having friends watch as if they were judges. Wear your testing outfit, give yourself a short warm-up and go through the test as if you were at the test session, without stopping. Make a list of everything you need to bring with you. It is always a good idea to pack extra things in case of emergency. Drinks get spilled, food gets dropped, dresses get ripped, laces break, screws come loose – always at the most inconvenient of times. Be sure you have extra laces, tights, dresses, sweaters, screws and a screw driver. This will help to alleviate extra and unnecessary stress at these already stressful events! Plan what you will do once you are at the rink—warming up, getting into your test clothes, and so on. Skates should be cleaned or polished – including laces. Make sure your boots and laces look their best. Tights should be clean and without holes. Be sure underpants do not show through – tights tend to be fairly transparent. A Central Gauteng uniform – Girls – red practice dress and cross- over red jerseys, or a suitable skating dress or skirt; Boys – black pants and red t-shirt should be worn for tests. No boot covers may be worn. Test and element dresses should be nice but not overly sparkly or showy. Solo dresses generally have more sparkle and should match your music. If you are from another province and attending Central Gauteng tests you have to wear your Provincial uniform. Hair should be done in a tidy fashion and make up applied. Remember the smiles, forget the tears. Cherish them now, cherish them forever. girls lost, some girls gained. To fix that motion and straighten that line. We took our chances but knew what was at stake. first we must show the world who is best. And we hide all the pain with a convincing smile. Give a little extra where there needs to be more. Regardless of what we win or place. Know your event, your time and location. Scrambling at the last minute causes unnecessary stress. Be sure to arrive a minimum of 45 minutes prior to your event time (if you are skating first) and minimum of 30 minutes prior to your event if you are not the first one on the test schedule. Events like these can run both ahead and behind schedule. We must be prepared for both. You don’t want to miss your event. Skaters should be dressed and ready to go (except skates on) thirty minutes prior to their event time. Skaters can begin warm up tasks and focus exercises so they are ready when they are called to the ice. 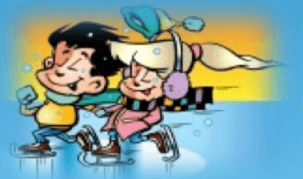 Don’t wander off while waiting to be called to the ice. Some people like to be alone, focusing on what they are about to do. Others prefer to be sociable. Do what works for you. Skaters, friends and family members must display good manners and sportsmanship at these events. When you step on the ice for the test, let the judges see how much you love to skate. Smile, bend your knees and breathe. You have prepared long and hard for this test. Show the judges what you can do. Your role at a test can be a major ingredient to your child’s performance. You are an important support system! Determining how and when you provide support is the challenge. Every child is different and has its own needs, which change over time. Their needs at a test day may be affected by the level of test being taken, demands of coaches, amount of free time, accreditation or access to your child, media presence and their own confidence in their ability. 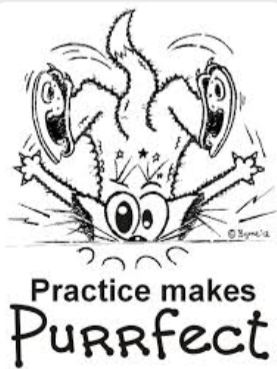 The most important thing to do before hand is to work out a pre-test routine with your skater and coach. Adhering to a routine gives a skater security and structure to a period of time that is totally unpredictable. Typically, an athlete may prefer to be alone, to walk through the test but needs to know you are not too far away, just in case they want to talk. Multiple instructions, trying to psych them up or calm them down, sometimes only adds to the problem. The most important thing is that they feel confident and that they are at an excitation level they can handle. You can facilitate this by presenting a calm, confident front and letting them do their thing. Often we express how we feel, more in the way we act and behave, than in what we say. If we are excited, tense, nervous, or anxious prior to a test, the skater will pick up on this. They will feel our anxiety in spite of our constant reassurances. Overt parental anxiety only adds to the degree of difficulty of the task they have to undertake. Above all, ensure that your child feels loved and valued no matter how they skate.